Dr. Azfar Khalid is a Senior Lecturer of Mechanical Engineering at Department of Engineering in the School of Science & Technology. 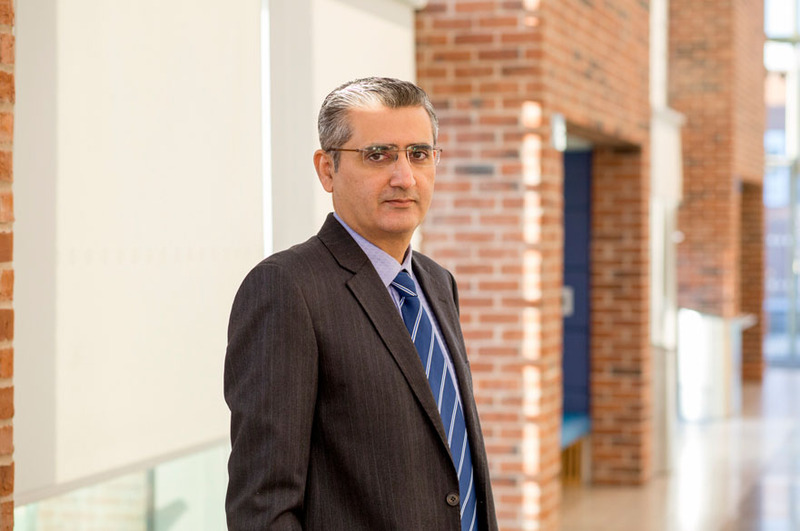 Dr. Khalid has a teaching role across the disciplines of Mechanical and Electronics Engineering. He is actively pursuing research on smart factory, human robot collaboration, cyber physical production systems and Industry 4.0. Moreover, he is also accreditation and student placement coordinator of the engineering department. Associate Professor at Department of Mechanical Engineering, Capital University of Science & Technology, Islamabad, Pakistan from 2014 to 2018. Postdoctoral Research Associate at Bremen Institute for production & Logistics (BIBA), University of Bremen, Germany in 2015-16 (On leave from CUST). Research Consultant at School of Mechanical & Manufacturing Engineering, National University of Science & Technology, Islamabad, Pakistan from 2010 to 2013. Teaching Assistant at Manufacturing Research group, School of Mechanical, Aerospace & Civil Engineering, University of Manchester from 2004 to 2009. Production Engineer in a Polypropylene Manufacturing plant from 2000 to 2002. Cyber Physical Production Systems: Future smart manufacturing systems are intelligent, self-decision-making systems in which cooperating modules interact through inter connected network. Virtual simulation of such systems can help in designing and managing complications beforehand, that can include occupational safety, process improvements, customized products and cybersecurity in complex industrial processes. Human Robot Collaboration: Working with collaborative robots in industrial setups is fast growing. However, studies related to occupational safety in human robot collaboration and collaborative workplace design are in infancy stage. This also includes psychological and stress related hazards due to task complications, cobot payload and other factors. Precision Engineering: This research area includes design and development of high precision manufacturing systems, CNC machines, metrology systems, desktop size machines for meso scale manufacturing, tactile and vision-based sensing and measurement systems. Robotic Manipulators: This focus area is for the development of application specific robotic manipulators in serial, parallel and hybrid configurations. Robot kinematic modelling, design, dynamics, controls, simulation of such systems and cobot development is of interest. Opportunities arise to carry out postgraduate research towards an MPhil / PhD in the areas identified above. Further information may be obtained on the NTU Research Degrees website. Referee of International Journals including ASME Journal of Robotics & Mechanisms, International Journal of Non-linear Mechanics (JNLM), Mechatronics (Elsevier), Logistics Research (Springer). IMechE Part B: Journal of Engineering Manufacture. Member of technical committee forums including 3rd International Symposium on Industrial Design & Engineering, Antalya, Turkey, 2018, Technology foresight forum on robotics and precision automotive manufacturing, PCST, Islamabad, 2017 and ICREATE 2014, at NUST, Islamabad, Pakistan. Referee to the International Conferences including LDIC, 2016, Germany - MCPL, 2016, Germany - IEEE INDIN 2009 UK - IEEE GCC conference & Exhibition, Muscat, Oman, 2015 – SAME, 2015, Islamabad – IEEE IBCAST, 2011-2014, Islamabad– FIT, 2011, Islamabad - ICREATE 2014, Islamabad. Session Chair of 5th LDIC 2016, Bremen, Germany and ICREATE 2014, Islamabad. Bremen Institute for Production & Logistics (BIBA), University of Bremen, Germany. Project InSA, (http://www.insa-projekt.de/) sponsored by the German Federal Ministry of Economics and Energy (Project Register Number: HRB 24505 HB) and ThyssenKrupp System Engineering GmbH as Industrial partner. School of Mechanical & Manufacturing Engineering, National University of Science & Technology and HEC, Islamabad, Pakistan. Intelligent Production Machines and Systems (IPROMS)’ from EU FP6 to develop tri-actuated parallel kinematic manipulator. Institute for Automotive and Manufacturing advanced practice (AMAP), University of Sunderland, UK for smart factory and IoT based manufacturing research hub. EU Erasmus Mundus Programme, cLINK (Centre of excellence for Learning, Innovation, Networking and Knowledge). Khalid A., Kirisci P.,Ghrairi Z., Thoben K.D. and Pannek J. (2016), A Methodology to develop Collaborative Robotic Cyber Physical Systems for Production Environments, Logistics Research, Vol. 9(1), pp. 1-15, Springer. Khalid A. and Khan Z. H., (2014), Multi-objective optimization for error compensation in intelligent micro-factory CPS in ‘Computational Intelligence for Decision Support in Cyber Physical Systems’, Springer, ISBN 978-981-4585-35-4. Hussain A., Khan Z. H., Khalid A. and Iqbal M., (2014), A comparison of pulse compression techniques for ranging applications in ‘Computational Intelligence for Decision Support in Cyber Physical Systems’, Springer, ISBN 978-981-4585-35-4. Khalid A., (2010), Robotic Manipulator Design & Construction: Design and synthesis of parallel robotic manipulators, Verlag DM, Germany, ISBN: 978-3-639-25915-5. Mekid S. and Khalid A., (2008), Chapter 5, Introduction to Parallel Kinematic Machines in ‘Introduction to Precision Machine Design & Error Assessment’, Mekid S. (Editor), CRC Press, ISBN: 9780849378867. Khalid A. and Mekid S., (2008), Computation and analysis of dexterous workspace in PKMs, International Journal of Digital Manufacturing, 1(1), 10 -13. Islam S.O., Khan L.A., Khalid A., Lughmani W.A. (Jan. 2019), A Smart Micro Factory Design: An Integrated Approach, 1st International Workshop on Functional Reverse Engineering of Machine Tools (WRE 2018), GIKI, Topi, KP, Pakistan. Khalid A., Kirisci P.,Ghrairi Z., Thoben K.D. and Pannek J. (2017), Towards implementing safety and security concepts for Human-Robot collaboration in the context of Industry 4.0, Proceedings of the 39th International MATADOR Conference on Advanced Manufacturing, Manchester, UK. Khalid A., Kirisci P.,Ghrairi Z., Pannek J. and Thoben K.D., (2016), Safety requirements in collaborative Human-Robot Cyber Physical system, 5th International Conference on Dynamics in Logistics (LDIC), Bremen, Germany. Mukhtar M. and Khalid A., (2014), Non-contact inspection for internal flow characteristics in pipe lines, 1st Applied Mechanical Engineering Conference (AMEC-2014), Lahore, Pakistan. Wahab A. and Khalid A., (2014), Non-contact metrology inspection system for precision micro products, International Conference on Robotics and Emerging Allied Technologies in Engineering (ICREATE 2014), Islamabad (NUST), Pakistan. Nawaz A. and Khalid A., (2014), Sensorless control of DC motor using Kalman Filter for low cost CNC machine tool, International Conference on Robotics and Emerging Allied Technologies in Engineering (ICREATE 2014), Islamabad (NUST), Pakistan. Wahab A., Khalid A. and Khan U. S., (2013), Dimensional inspection system for meso-scale artefacts using sub-pixel edge detection technique, International Conference on Modeling & Simulation (ICOMS), Islamabad, Pakistan, 394-398. Khalid A. and Mekid S., (2010), Design synthesis of a three legged SPS parallel manipulator, 36th International MATADOR Conference, Manchester, UK. Khalid A. and Mekid S., (2010), Characteristics analysis of parallel platform simulators with different hardware configurations, Proceedings of the 7th International Bhurban Conference on Applied Science & Technology (IBCAST), Islamabad, Pakistan, 181-186. Mekid S., Khalid A. and Ogedengbe T., (2008), Common physical problems in micromachining, 6th CIRP International Conference on Intelligent Computation in Manufacturing Engineering - CIRP ICME '08. Ischia (Naples), Italy. Khalid A. and Mekid S., (2007), Jacobian inversion analysis and extraction of dexterous workspace in PKMs, 35th International MATADOR Conference, Taipei, Taiwan, 293-296. Khalid A. and Mekid S., (2007), Computation and analysis of dexterous workspace in PKMs, Proceedings of the 3rd International Conference on Intelligent Production Machines and Systems (IPROMS), Elsevier. Mekid S. and Khalid A., (2006), Robust design with error optimization analysis of a CNC micro milling machine, 5th CIRP International Conference on Intelligent Computation in Manufacturing Engineering - CIRP ICME '06. Ischia (Naples), Italy. Khalid A. and Mekid S., (2006), Design of precision desktop machine tools for meso-machining, Proceedings of the 2nd International Conference on Intelligent Production Machines and Systems (IPROMS), Elsevier, 165-170. Khalid A. and Mekid S., (2006), Design optimization analysis of a micro machine tool, 6th International Conference of the European Society for Precision Engineering and Nanotechnology (EUSPEN), Baden, Austria, 365-368.